I usually make something a bit more substantial even when going meatless, but this weekend was so full of meat, all I was craving today was salad. I hadn’t thought about this dressing for years until food52 issued a “Best Carrot Recipe” contest and it was the first thing to pop into my head. It’s a dressing that caught on in New York’s East Village, at Japanese-ish diners geared towards students. I was happy at any restaurant where it was a dressing choice, and am surprised it hasn’t caught on as one of the standard dressings, though I don’t think it would bottle well. I had a bit of a recipe from from my New York years, but after my recent googling, it was lacking a couple of the key ingredients like shallots and, surprisingly, water (and perhaps had some extra garlic and sesame). Luckily, after trying the version Smitten Kitchen posted, even though I had my reservations as her reference was the heinously named newsletter GOOP by Gwyneth Paltrow which suggested accelerating bowel movements by drinking castor oil in the same post. But it just sounded right. Though the restaurant version was most frequently some sort of lettuce, avocado, onion combination suggested in the other posts, I find that this dressing pairs perfectly with kale. It brings out the slight sweetness that’s usually in kale, particularly the Lacinato (dinosaur) kale I usually have growing in my backyard. Peel and roughly chop carrots, shallots, and ginger. I usually peel ginger with a spoon–it is the fastest, least wasteful method I’ve learned. Then process carrots, shallots, and ginger in a food processor until very finely chopped. Add miso, scrape down, and run food processor again. Pour neutral oil in while blade is running, then add water until smoot, and desired consistency. It shouldn’t be liquid, pourable, but it shouldn’t be completely chunky either. You may need a little more than 2 T water. Add sesame oil and process briefly. I like to serve with a simple salad of kale/cabbage salad. 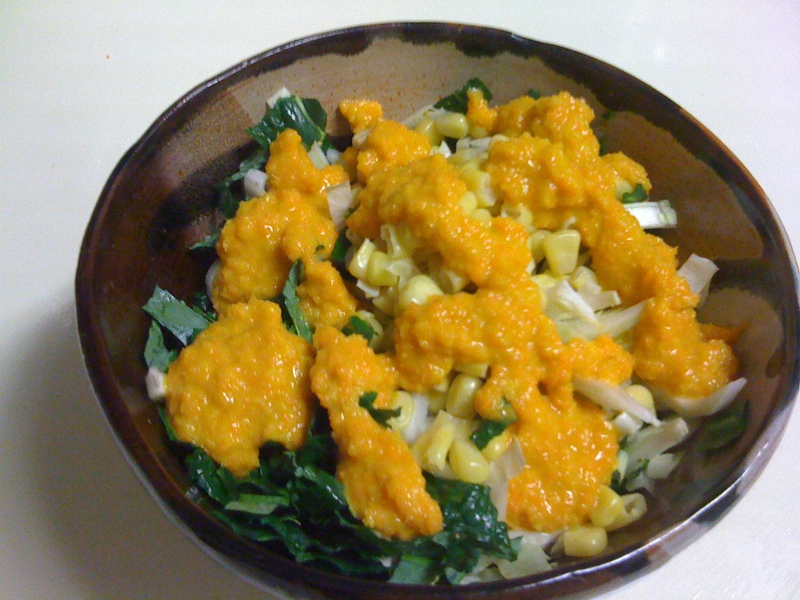 This particular salad is ~2/3 Dinosaur (Lacinato) kale, ~1/3 cabbage, garnished with sweet corn. Other delicious garnishes include fresh peas, sesame seeds, avocado, or pressed tofu.